Hollywood, CA. / (323) 466-FILM. As of early April 2019, there is word that Netflix might buy the Egyptian theater, and use it for their premieres and other screenings. Despite the fact that Netflix is known for home streaming, they have, in fact, in fact held a number of theatrical premieres in Hollywood to generate publicity for their major original productions. So, having a place to easily stage those premieres on a regular basis make sense for the company. Reports are that Netflix and American Cinematheque might end up sharing the theater, with Netflix using it for their premieres, and American Cinematheque using it for their usual film screenings. I will update this page when there is more news about the possible acquisition. The Egyptian Theatre is one of the most historic buildings in Hollywood. And perhaps more than any other structure on Hollywood Boulevard, its history can be seen as a symbol for the rise & fall - and resurrection - of Tinseltown's 'Main Street'. Once upon a time, the center of movie-going in Los Angeles was the Broadway theatre district in downtown Los Angeles. Broadway was where the public flocked to see silver screen classics in lavish movie palaces such as The Million Dollar Theatre, the Palace and the Orpheum. But in 1922, showman Sid Grauman (who owned several of the Broadway movie palaces) helped shift the entertainment center from downtown to Hollywood Blvd. when he built the Egyptian Theatre - five years before Grauman built his famous Chinese Theatre down the street. The Egyptian theme was inspired by the discovery of King Tut's tomb in that very same year. Like the Chinese Theatre, it had an open courtyard out front to draw in passersby off the sidewalk. This forecourt featured massive, four-feet wide Egyptian-style columns, hieroglyphics, murals, a tiled fountain, large pots filled with exotic plants, and even a 12-foot figure of a dog-headed Egyptian god guarding the portico. These forecourts also served as a congregating place for the press and fans during the many gala movie premieres Grauman liked to stage, a particularly Hollywood form of publicity stunt employed by the studios to generate media excitement for their newly-released films. 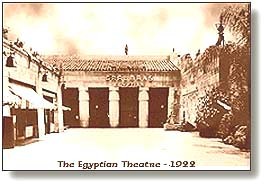 Fittingly, the Egyptian's grand opening was also the occasion for Hollywood's very first movie premiere in October of 1922. 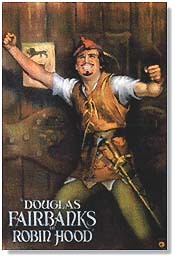 The movie that opened the new theatre was "Robin Hood" (starring Douglas Fairbanks and Wallace Beery.) Staged in typical Grauman fashion with bright lights, stars and a red carpet, that initial gala inspired countless subsequent movie premieres, a Hollywood tradition which continue to this very day. Sid Grauman also pioneered the presentation of live stage shows in his theatres before the movie started, something that has been used to great success in recent years by the Disney company at their restored El Capitan Theatre (a block west of the Egyptian). Actress Myrna Loy ("The Thin Man") was a dancer in one of the shows at the Egyptian when she was 18, back in 1923, where she was discovered by none other than Rudolph Valentino. Inside, the auditorium seated 1,760 people, dwarfing most modern theatres. And it was a popular place to catch a movie. "Ben-Hur" ran at the Egyptian for a record two years straight, while "My Fair Lady" and "South Pacific" both ran for an entire year. Alas, with the decline of Hollywood, the Egyptian also began a slow fall from grace. The last movie premiere to be held at the landmark theatre was that of Barbra Streisand's "Funny Girl" in 1968. The theatre's stage and the dramatic columns that framed its screen were torn down in 1970 to permit showing of wide-screen epics. 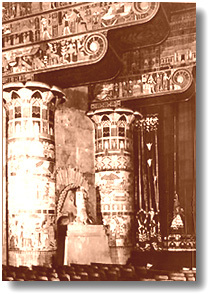 Finally, in 1992, after suffering extensive earthquake damage, the Egyptian closed its doors - seemingly forever. But if the empty Egyptian represented the rundown state of Hollywood Boulevard just a few years ago, then the theatre's preservation and present rebirth must be seen as one unmistakable sign of Hollywood's current renaissance-in- progress. As such, it joins such bright spots at the El Capitan, the Hollywood Roosevelt, and the new Hollywood Entertainment Museum as symbols of the boulevard's slow-but-steady revival, now only awaiting the new Hollywood & Highland project to bring together the street's diverse elements into a critical mass that will transform downtown Hollywood. The newly-restored Egyptian re-opened in December of 1998 with a re-premiere of Cecil B. DeMille's "The Ten Commandments," exactly 75-years to the day after the movie premiered at the Egyptian in 1923. The theater is the new, permanent home of American Cinematheque, a non-profit organization dedicated to presentation of the motion picture, especially those films rarely seen by the general public. The first new movie to open at the restored Egyptian was, appropriately enough, Dreamworks' "Prince of Egypt." The landmark building has been fully restored, right down to the Sphinx heads and hieroglyphics in the forecourt, and the decorative starburst which hid the organ loft inside the theatre's bright blue ceiling. More than $14 million was poured into the restoration effort, as workers stripped away the gaudy additions of recent years and returned the Egyptian to the way it looked back when it first opened in 1922. A 1922 Wurlitzer organ will even be installed for silent film presentations. Although the bulk of Cinematheque's programming takes place in the evening, they have also provided a way for tourists on Hollywood Boulevard to enjoy the Egyptian during the daytime hours. Beginning in December of 1999, the theatre began screening a new film about the history of Hollywood, titled "Forever Hollywood." The hour-long documentary, which looks into the history of Hollywood, features interviews with stars such as Robert Redford, Warren Beatty, Jack Lemmon and Kevin Spacey talking about what first inspired their love of Hollywood and the movies. It also features clips from films and rare footage of Hollywood through the years. This special movie screens every day of the week (except Monday), four times a day, at 2 PM and 3:30 PM. Admission to "Forever Hollywood" is $9 for adults and $8 for seniors, students and children. Guided tours of the historic theatre are also offered from time to time, often in combination with a screening of "Forever Hollywood." Contact the theater for dates and times of upcoming tours. At night, the Egyptian features the standard Cinematheque offering of documentaries, independent films, classic film revivals, and premieres in both the main 650-seat auditorium and a smaller 80-seat screening room (named after its donor, Steven Speilberg). Sliding walls glide open to reveal the preserved interior of the original theatre to the entering audience, then slide shut to create a new state-of-the-art "theatre within a theatre," inside a palace originally built to show silent movies. It's easy to see a star at the Egyptian. They regularly hold screenings where celebrities appear live and in person to discuss their films. And the public can buy tickets to these special programs for just $9. They've recently played host to such stars as George Clooney, Nicole Kidman, Robin Williams, Diane Lane, Mariel Hemingway, Jennifer Jason Leigh, Christopher Walken, Carol Channing, Ray Liotta, Alan Arkin and Malcolm MacDowell. Tickets: Tickets are available at the theatre box office, but notover the phone (except for members). The box office opens 30 minutes before the first show of the day. Advance tickets can be purchased at the theatre box office up to 30 days in advance. You can also mail in an advance order or fax (323-467-0163) in an order. Click here for full details about tickets. Parking: there are attended lots on Macdden Place and on Las Palmas (South of Hollywood Blvd.) Parking is $5-$6 flat rate. Also, just north of Hollywood Blvd., on the east side of Cherokee, is a Municipal parking lot (east of Musso & Frank,) where the first two hours are $1.